Google's web search toolbelt has been updated and it now includes an option that lets you find web pages from a user-defined period of time. After performing a search, click on "Show options", select "Custom date range" and enter at least one of the two dates. Until now, you could only find images from the past 24 hours, the past week or the past year. If you edited Google's URL, the feature could be used to find pages from the past 10 days, 2 months or other custom periods of time, but you couldn't use it to find pages from 2006. "Google tries to estimate the publication date for a page by using information such as the date Google first crawled the page," explains Google's help center. Google also uses the dates included in web pages if they are good candidates for the published date. Since Google's date is only an estimation, it should be taken with a grain of salt. Power tip: The new feature is the only way you can find videos from a certain date range in Google Video. Just restrict the results to "videos". That's a good feature :) ! I like the "date range". But do you know how exactly it is ranged ? it doesnt appear on my toolbelt, how can i activate this feature? You can also sort the results by date. If you don't see the new feature, then it's either just a limited experiment or it's slowly rolled out to all data centers. It's good that Google is rolling this out, but they've added yet another bit of interface inconsistency across their services. "Date is not valid. Specify a month, day and year." But why? Entering just the year is perfectly valid when searching Google News by date. Instead of complaining that the user did something wrong, why not just perform the search? You know what I meant, Google. There's no reason to force me to prepend "1/1" and "12/31." Google Groups: You have to click "Advanced Group Search." Then you've got to futz with tedious drop-down boxes for 2 sets of months, days, and years. 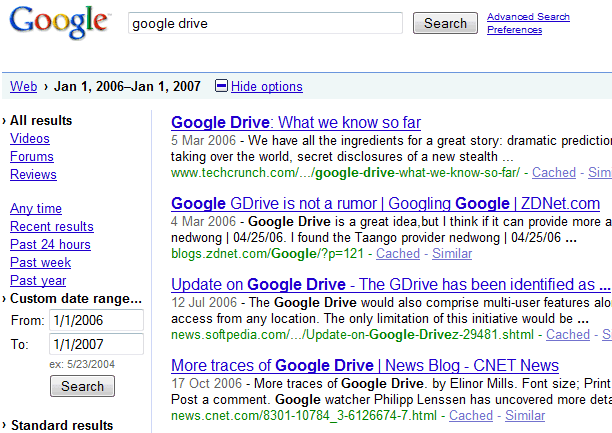 Google News Archive Search: Click "Advanced archive search" (note: even the capitalization here differs from the advanced search link text at Google Groups). The "Return results published between" area is much more user friendly. You can enter a combination of exact dates, just month and year, or just years. You can leave a part of the range blank, and Google will handle the input intelligently. Google Web Search: Click "Show Options" and "Custom Date Range." There are no annoying drop-downs as with Google Groups, but you *must* enter exact date(s). You can leave one of the dates blank as with Google News, and Google will substitute December 31, 1969 for the "from" date or today's date for the "to" date. This might seem nitpicky, but avoiding clunky interface elements should be a no-brainer for Google. The defection of ex-Google Visual Design Lead Douglas Bowman to Twitter this spring was widely covered on tech blogs and tech news sites. Recall that Mr. Bowman complained about getting mired in minutiae about such things as whether a border should be 3, 4 or 5 pixels wide or which of 41 shades of blue would look best on the screen. How can a company that has such exacting standards mess up on usability to this degree? The Custom Date Range is back. Maybe they removed it to add something to it. There used to be a "daterange" paramater, with Julian calendar format date. It doesn't work anymore. Anyway, it doesn't work as well as the former one because if I write "09/11/2001" in an article Google will think it was published on this date. Google's algos are not that dumb. For example, this post has a lot of dates, but Google detects the right pattern. I wish Google would get Gdrive up and runnig or drop it. I'm sick of hearing about it. I don't know what data centers you are talking about. I am using 2 computers side by side hooking up to the same router. Both are using Firefox 3.0.12 . One shows the new google daterange on the left sidebar, the other not. When you go to google.com, Google sends your request to one of the data centers that's close to you and that's able to complete your request. Even if you use the same browser and the same computer, two requests to google.com could involve two different data centers. too bad the tool belt update doesn't apply to google's search experiments. I still don't quite understand why my right pc will consistently use the same data center and show the new google daterange on the left sidebar. While my left pc will consistently use the wrong data center and REFUSE to show the new google daterange on the left sidebar. Anyway, I overcame the problem by copying Firefox specifications from the right pc using Mozbackup and use the backup results on the left pc , and bingo, both pc now talk to the same data center. Funny how Firefox and google data center work. Google has many data centers: some of them have the latest updates, others are still in the process of being upgraded. Assuming that Google has 100 data centers and 70 of them have the latest updates, there's a 70% chance that you'll see the new feature when you connect to google.com. Sometimes you'll keep using the same data center for awhile. I'd like to know how to select a specific data site.